E2S designs and manufactures high-performance audible and visible signalling devices for use in industrial, marine and hazardous area applications. To assist system integrators and specifiers to choose an effective signal for their specific application E2S has launched technical bulletins library offering product information in a concise format. The first three bulletins published cover two specialist products, Hootronic and Appello, and the dB(A) performance of their AlertAlarm industrial range. The Hootronic family, which electronically produces realistic legacy electro-mechanical signalling device alarm sounds such as the industrial claxon / motor driven horn, the motor driven siren, the electro mechanical buzzer / horn and the traditional electro mechanical bell, is available in a number of different configurations with outputs from 112 dB(A) to 124dB(A). The primary advantages of the Hootronic unit are its increased reliability and much reduced current requirements when compared to the original motor-driven devices. The Appello next generation user-recordable alarm signals can store up to 2 minutes of content enabling specific messages or instructions to be played with or without any of the 45 tones already on the device. Outputs range from 105dB(A) to 121 dB(A). 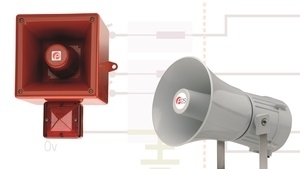 The AlertAlarm family is available with three or four stages with maximum output levels from 104 dB(A) to 131dB(A) at 1m.